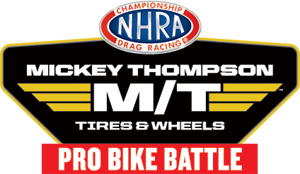 The Mickey Thompson Tires Pro Bike Battle is a yearly race-within-a-race bonus event for the Pro Stock Motorcycle competitors in the NHRA Mello Yello Drag Racing Series. In its third season, the all-star field raced at the Toyota NHRA Sonoma Nationals at Sonoma Raceway and featured a field of world-class Pro Stock Motorcycle racers. The riders earn points into the specialty event based upon points awarded for final qualifying positions at each Pro Stock Motorcycle national event leading up to the 2018 Mickey Thompson Tires Pro Bike Battle during the Toyota NHRA Sonoma Nationals on July 27-29. Riders will compete for a total purse of $10,000 and the winner receives $7,500 and the runner-up will earn $2,500. The 2017 field for the event included Jerry Savoie, Matt Smith, Andrew Hines, Angelle Sampey, Hector Arana, Chip Ellis, L.E. Tonglet, and Eddie Krawiec. Tonglet won an eventful final-round contest against Krawiec. The starting-line edge went to Krawiec, who had a deadly .015-second reaction time, but when his Harley-Davidson Street Rod began to drift to the center line, Krawiec was forced to lift. Tonglet went ahead to take the win stripe with a time of 6.827.